Wastewater may be of domestic or industrial origin. The degree of treatment varies. 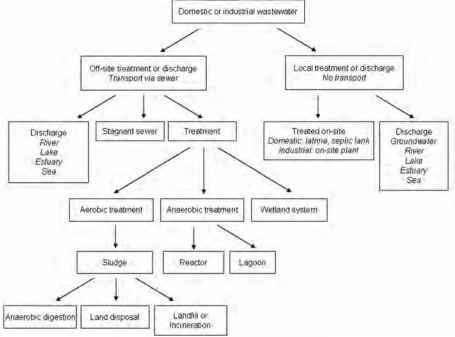 Wastewater may be discharged directly in (coastal) surface water or treated prior to discharge (Figure 10.5). Wastewater in developed countries is usually treated in conventional centralized aerobic treatment plants. Industrial wastewater may be treated (in-plant) for process water recirculation and prior to discharge. Depending on the nature of the industry this treatment may also be anaerobic. Wastewater from the food industry is often easily treated with anaerobic methods, and even wastewaters from chemical industries can often be treated with anaerobic technologies, despite the presence of toxic compounds (Lettinga, 1995). Special measures have to be taken to enable anaerobic treatment in the latter case, i.e. 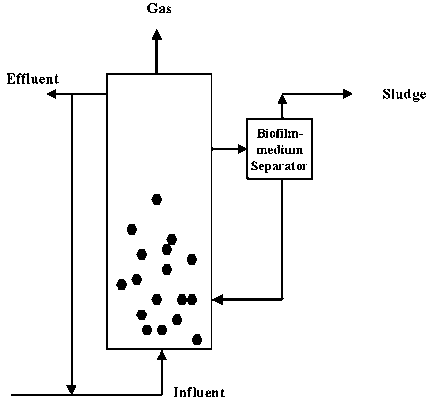 application of special reactor designs with sludge retention or inoculation of the anaerobic sludge with specialized bacteria. In warmer climates, with higher ambient temperatures, anaerobic treatment is also used for domestic wastewater treatment. system. Open sewers, networks of open canals, gutters and ditches, may all act as a source of CH4. Closed sewers are not considered to be a source of CH4 emission (IPCC, 2006d). The amount of CH4 formed in open sewers will be directly related to the amount of biodegradable COD present in the wastewater and local conditions, particularly temperature. This is also the case for direct discharge of wastewater to the land surface and the treatment of sludge that is formed during primary, secondary and tertiary treatment. Therefore, the amount of CH4 formed is very difficult to assess and will not be discussed in more detail in this chapter.